As part of this past week's Back to Homeschool blog hop, I posted on Amber's goals for this school year. One of the big goals is getting back into a regular daily schedule. So, you know of course, we didn't manage any type of regular schedule any day this week. Having become so accustomed to the random lesson schedule over the past year, we managed quite well for Amber's school with nearly a full load of lessons. Still, considering we had no medical appointments this week, it feels like a lost opportunity to make schedule alterations. But, on with the show. 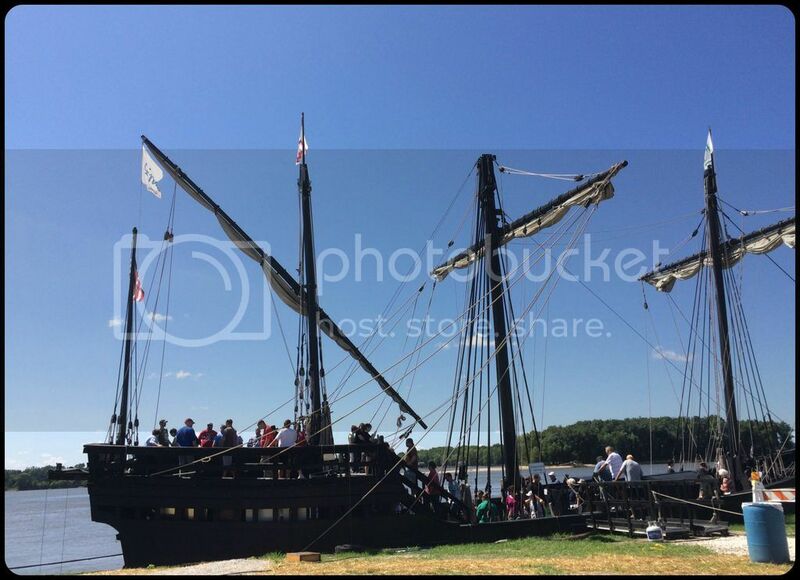 Tuesday we drove up to Grafton, Illinois to see the reproduction Nina and Pinta ships that are docked there. The original plan was to pick up my mom, drive north a half hour, or so, to take the ferry across the rivers (Missouri & Mississippi). Thankfully, I checked the ferry schedule at the last minute and found the ferry wasn't running that day. Instead we just took the St. Louis highways and crossed the Mississippi River farther south, then drove north on the Great River Road. As much as I wanted Amber to experience the ferry, I think she might have enjoyed the Great River Road more and it was a shorter drive. 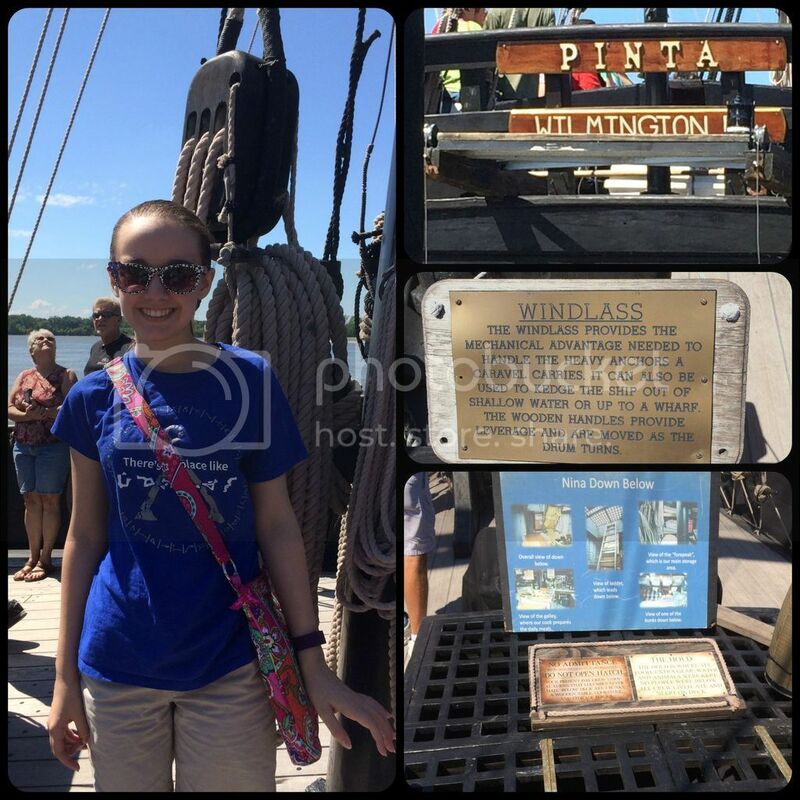 Amber on the Pinta; Looking back at the Pinta from the Nina; Windlass information, and the Nina down below. The crew currently live in the down below sections of the ships. We didn't spend a long time on the ships, since the below decks is not open. However it was interesting to see the scale of the ships. We think of them as being huge ships used for exploring, but they are actually quite tiny. The hourly tour paddle boats on the Mississippi are larger, by far. We did learn quite a bit about sailing and life on the ship. Amber did fairly with the walking and the sun. There was quite a bit of shade on the ships which helped us remain as long as we desired. While the two ships are docked securely and I wasn't feeling any motion, Amber did get dizzy on the Nina in the aft section. Her body can sense so much that mine does not. All in all it was a fun field trip and especially appropriate as Amber is working on her explorers unit still. The latter portion of the week has been fairly slow for us. Amber had been mildly congested for a couple of days, but we attributed it to her allergy nasal spray running low. It's never as effective at the end. But by Tuesday night we realized she might actually have a summer cold. It explained much about how her body was reacting over the weekend. So, we canceled her Wednesday flute lesson and a day with with her friend on Thursday in order for her to rest and keep her germs at home. I've tried to sanitize as much of the house as possible. I think she's on the mend now. She definitely has more energy with less congestion. Amber still has possession of our master bedroom TV in her playroom and is quite loathe to give it back. Since we haven't needed it in the bedroom, it's not been an issue. I expect it will be shortly. Fred and I did finally convince Amber to give Stargate SG1 another try. Okay, convince is inaccurate. She was tired and we turned it on when she didn't have the energy to go elsewhere. Amber loved Stargate Atlantis, but barely made it through one season of SG1 before giving up. The humor was a bit above her head the first time. Looking like a regular school day again. Plus my TV still on the floor of the old playroom with Amber relaxing in there. I wonder when I'll get it back. Low and behold, but the girl is now Stargate obsessed now, which makes me happy since SG1 and Atlantis are my two favorite shows ever. We are slowly making our way through SG1 having just begin season 3. The plan is to re-watch Atlantis again as it was originally aired with SG1 when we get far enough along. 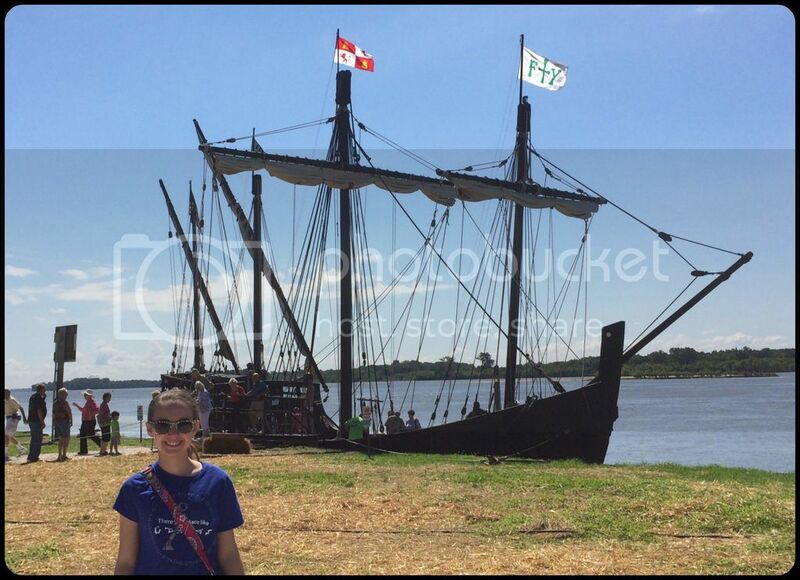 Amber is excited and even wore her Stargate t-shirt on the field trip Tuesday. Of course, I'm not allowed to wear my Stargate t-shirt on the same day. Just like she'll happily wear her Star Wars t-shirt, if I'm not wearing mine. Teenagers. I always imagined the ships to be 3 to 4 times that size. They are not much bigger than the Viking ships that made it to Newfoundland. My kids started watching Stargate but never finished. With all our new streaming 'options' I should see if it is on there somewhere. Since she got dizzy on a moored ship it is probably good the ferry wasn't operating. Stargate is on Amazon Prime streaming. Even though we own all the DVDs, we're using the Prime streaming because it's easier than switching out the DVDs. We're lazy that way. I didn't even think about Amber getting dizzy on the ferry. I guess it was a good thing we couldn't take it after all. Unfortunately we don't get Amazon Prime. Are streaming services are a joke compared to what is available on the US services. It is to the point that a lot of Canadian use gray area methods to access the American services. My wife's employer is a big entertainment company so I stay strictly out of the gray area. Ahh. I didn't even think about the Canadian differences. I stay clear of gray areas too. I checked Netflix and it doesn't have Stargate. It has Firefly, Farscape, all the Star Treks, Warehouse 13, Eureka, and even MacGyver. What a neat field trip! I must admit that I'm a bit shocked at just how small the ships actually are/were! I cannot imagine them out on the open sea! I'm glad Amber was able to manage the trip well. Sorry about the cold though. Funny thing...Jeremiah had one too!